The cast and crew of the Aqua Kids television series traveled to the Virginia Institute of Marine Science’s Gloucester Point and Wachapreague campuses in July to interview scientists and learn about local marine research as they filmed several episodes for their 11th season airing this fall. An educational children’s program, Aqua Kids strives to educate young people about the importance of protecting marine environments and the animals that live there. The show—currently in the middle of filming its new season—is broadcast weekly on more than 130 stations across the United States. With a target audience of children ages 13 to 16 years old, the show’s stars travel the globe and share their adventures and lessons learned about preserving the ocean. The Aqua Kids’ cast and crew spent almost two weeks at VIMS, helping researchers collect animals for the annual Juvenile Fish and Blue Crab Survey, re-establish scallops to Virginia’s Eastern Shore at VIMS’ Wachapreague campus, and study terrapin turtles alongside researchers with the Chesapeake Bay National Estuarine Research Reserve. They also did field and lab work related to marine debris, marsh habitats, climate change, and much more. 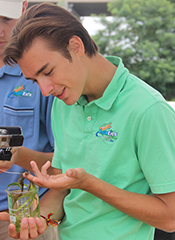 During each Aqua Kids episode, viewers see Parades and fellow cast members Drew Bostick and Andrew Pidduck join with host Hannah Jones to question experts concerning important issues and challenges in marine science. The cast filmed a wide variety of scenes during their time at VIMS, including a visit to the VIMS Oyster Hatchery with Professor Stan Allen, a stint studying blue crabs with Marine Scientist Michael Seebo, a look at underwater gliders with Assistant Professor Donglai Gong, and a primer on blue crab diseases and parasites with Professor Jeff Shields. The Aqua Kids were enamored with the 6-foot-long, 150-pound Slocum glider Gong uses to perform his oceanographic research. Gong explained that the bright yellow glider—which the Aqua Kids say “looks like a banana”—is an autonomous underwater vehicle that combines changes in buoyancy with a pair of fins to propel itself through the water. Aqua Kids has been honored with a number of prestigious awards, including 2 Emmy Awards, 15 Telly Awards, 2 Videographer Awards, and more. The show also received the first Marine Awareness for Children Award by Marine BizTV. The new episodes will air between October 1st and December 31st on WTVZ. Check out the Aqua Kids' Season 11 promo!